The Trump administration has argued that its new “zero-tolerance” immigration policy will lead to less crime. Research suggests the opposite is true. 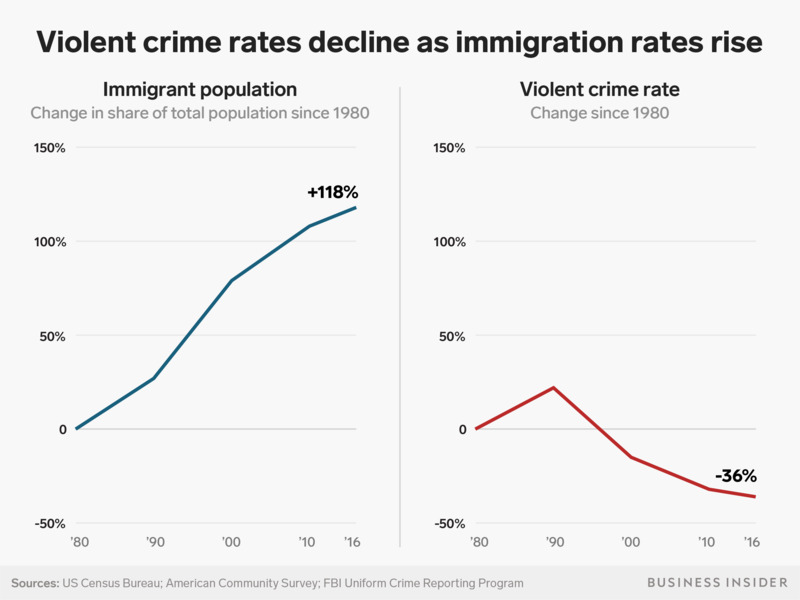 As immigration rates have climbed over the past four decades, violent crime rates have significantly declined nationwide, both in urban hubs and smaller towns. The 10 places with the largest increases in immigrants had lower crime rates in 2016 than in 1980. 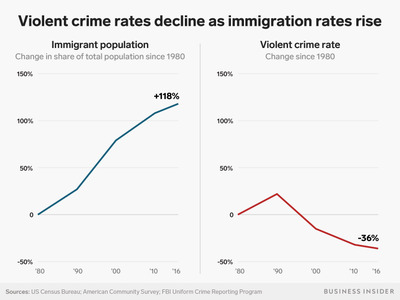 Regardless, there may be no correlation between crime and immigration. Earlier this year, the Trump administration enacted perhaps its strictest immigration order yet. The Department of Homeland Security is now prosecuting any migrant who attempts to cross the southern border, even those fleeing violence or domestic abuse. After an AP report revealed that nearly 2,000 migrant children were separated from their parents in the span of six months this spring, protests against the policy from both sides of the aisle ensued. On Wednesday, Trump backpedaled by signing an executive order to stop family separation, but still held firm on the “zero-tolerance” policy. The Trump administration reasons that the policy will help control crime in the US, but the numbers tell a different story. One of the most expansive studies on this topic was conducted in 2016. Using data from the US Census and FBI, researchers from four universities analysed immigration rates and crime rates for 200 metro areas over the last several decades. Equally distributed across the country, these areas included big cities like Los Angeles as well as smaller towns like Muncie, Indiana. As The New York Times notes, crime fell more often than it rose in these cities even as immigrant populations grew. In 136 metro areas, the immigrant population increased between 1980 and 2016, while crime stayed stable or decreased. The number of areas where immigration and crime both increased was much lower (54 metros). The 10 cities with the largest increases in immigrants had lower crime rates in 2016 than in 1980. Another study, published in February by the Cairo Institute, compared criminal conviction rates per 100,000 residents for native-born citizens and undocumented immigrants in Texas in 2015. It found that native-born Americans committed 1,794 crimes, while undocumented immigrants perpetrated 782. Regardless, the data doesn’t suggest that open borders lead to more crime – or that there’s a relationship between them at all. The causes of crime are likely much more nuanced.